Well this is turning into a pretty serious situation in a hurry. Of course I can’t imagine after taking some time to step away that Rokuro actually was the one corrupted in this scenario. 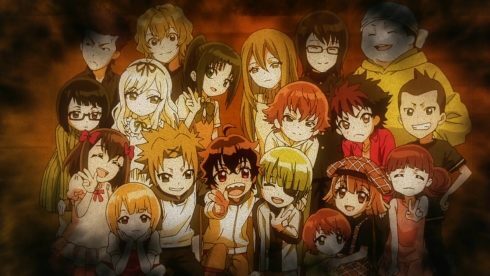 I honestly don’t think there’d be coming back as the MC in this show if he himself actually went ahead and killed all his friends. Honestly I think at most a friend or two were the ones corrupted, they went around slaughtering everyone and through great pains Rokuro managed to bring them down. Possible it goes the other way, no telling at this point. 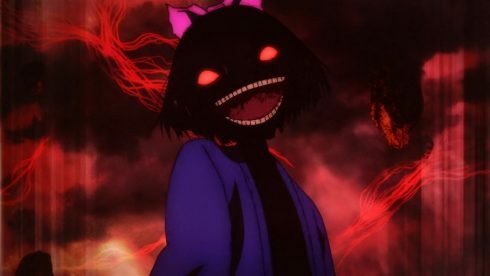 But I just can’t see the story continuing onward if Rokuro had actually gone berserk and killed everyone. In the end we certainly didn’t get the whole picture as of yet. That opening scene seemed to show Rokuro outright losing his arm and we still haven’t seen how he’s still got two perfectly good ones. True enough the opening scene was vague enough that it could go either way. Either apologizing for going berserk and killing them, or apologizing for freezing up during the slaughter and not being able to save them. I only lean towards him not actually doing it since…there’s no sign of anyone else in that opening scene. 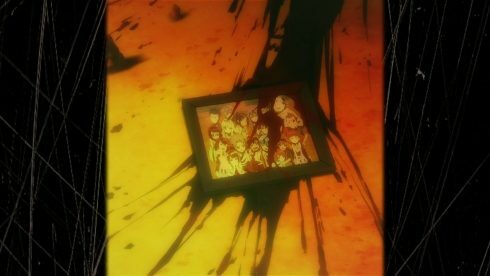 While I could see Rokuro suffering injuries stopping the one who went berserk and being the last one standing, I just find it less likely that he was stopped and was left the last one standing. Certainly don’t care that much for Seigen at this point. He may have reasons for his actions, but honestly just seems like an arrogant jerk. Just acting ungodly superior and beating up on anyone who talks back to him. Could deserve a good beating in order to smooth out that attitude a bit. 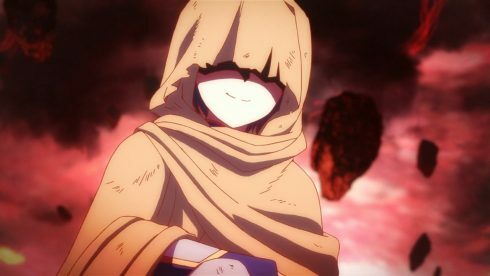 I’d say he was acting because he was upset about Mayura being in that mess…but he was acting like that before he even went into Magano. Not to mention…getting pissed at the people who saved your daughter just seems utterly ungrateful. If you want to be a jerk do it after you get your kid to safety….geeze. This isn’t a freaking public park here, this is full of dangerous Kegare. 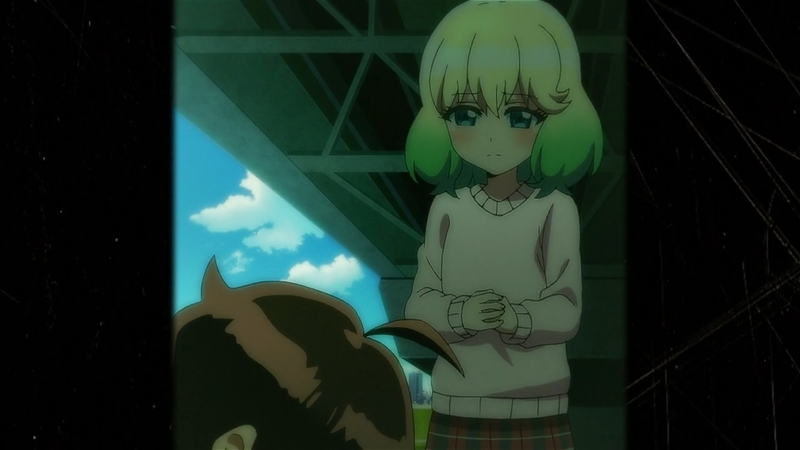 Get Mayura the heck out of there and then start acting cocky. No doubt this is the guy who taught Rokuro how to fight initially. A lot of similarities with that arm and his combat style. Can say that much for Ryougo since….well he doesn’t have much of a style. He just mostly uses that sword like the rest of his allies. Kind of that average tier who isn’t elite enough to have anything overly special about him. No shock that this guy is powerful enough to be in that upper tier of onmyouji. Kind of ridiculous really to demand Rokuro give his all and beat him in a fight. In the end Rokuro is more useful than not, so might as well use him if he’s willing to fight. Some good early conflict though. 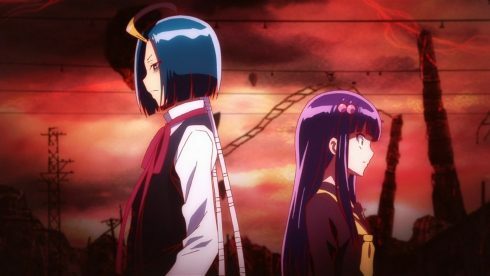 Really taking the whole Mayura (normal life) vs Benio (onmyouji life) conflict and going all out with it. 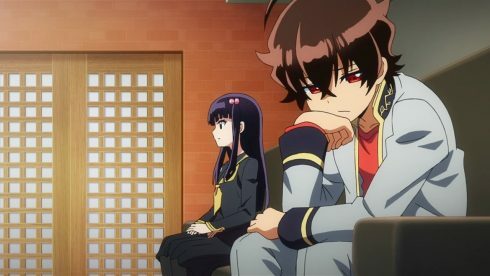 Both representing what Rokuro could do with his life and the kind of person he could be with as a result. 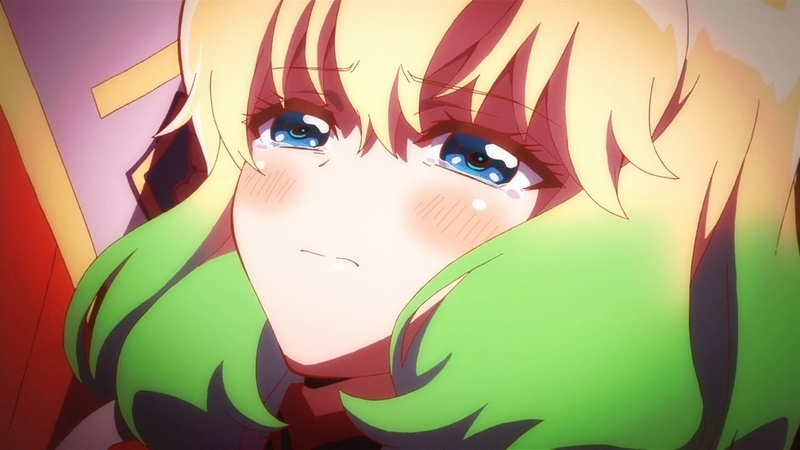 Honestly, Mayura would have a much stronger position if she’d just admit to being in love with Rokuro. Kind of shame on her for wasting all that time. That he was dealing with grief was a fair issue, but once he started confessing left and right….was probably a good time to just open up. No point being pissed off when you can’t actually offer anything that Rokuro is good for in a normal life or anything special he could have going for him. 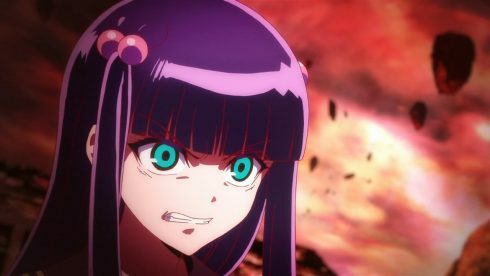 At this point Benio is the only one who can say that Rokuro has something special going for him and that’s in terms of his combat ability. 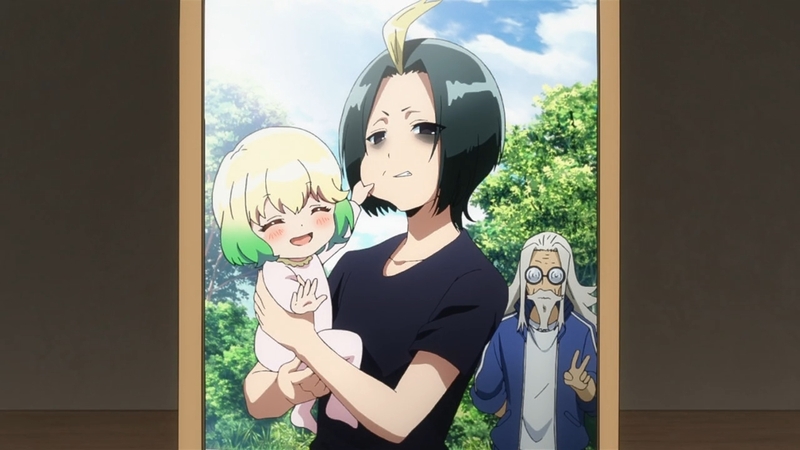 A fair point as well that Mayura has a lot of potential, but that’s almost a given considering her family. 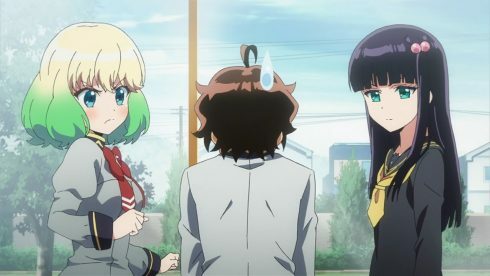 Of course we’ve moved nicely into another massive conflict with Benio. Will admit if nothing else I didn’t expect her to be completely involved in that massacre. Kind of a crazy situation, but I suppose it does lead to good drama. I’m just not sure how you resolve this. 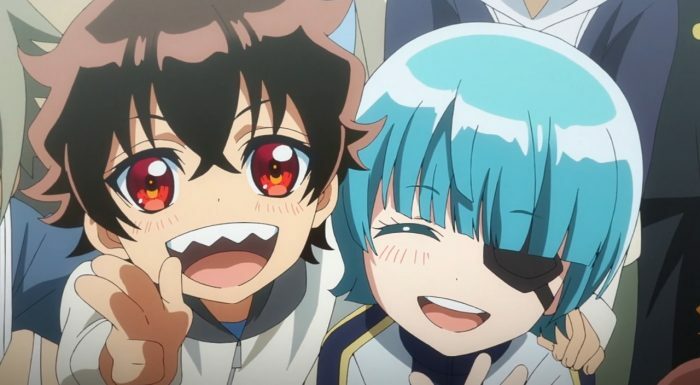 Honestly if Rokuro killed her brother…that should end the show. 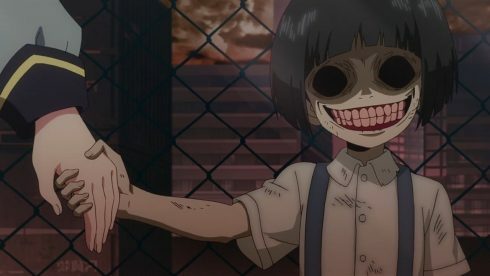 If Rokuro went berserk, if her brother was corrupted, it really doesn’t matter. I’m not sure how Benio could honestly get close to someone who killed her brother for any reason. The only way out is if Yuto was a victim of another student going berserk. Maybe it’s just me, but there are just some situations that should probably end a possible relationship. Regardless, can’t blame Benio for getting aggravated. Heck, it’s rather impressive that she hasn’t already tried to gut Rokuro here. Probably only hasn’t because it is the end of the episode. After watching a certain summer blockbuster can say that people lashing out of grief and rage is very understandable. All the more so when you add a feeling of betrayal into it. That Rokuro didn’t tell her about this is just adding to the fire. Sure, he didn’t know everything either, but a person can hardly be rational in this kind of situation. Either way that they got this far without delving more into their personal histories kind of lead to this kind of emotional clash. Though the biggest problem is Rokuro hesitating. Right now Benio knows just enough to be really pissed off. 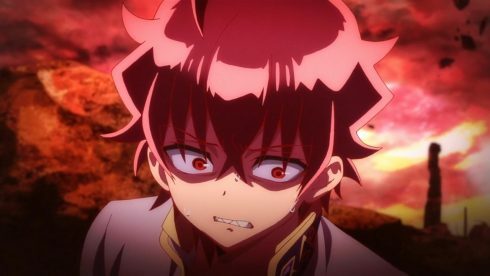 Even if it is the worst case scenarios that Rokuro was corrupted and killed Yuto, or that Yuto was the one corrupted….he has to speak up. I still think it’s more likely that Yuto was the corrupted one though. They talk about humans turning into kegare in some cases…but not that they can turn back to normal. Oh and hey we also have the mysterious figure hanging around the area. I can’t imagine that is good, especially after the whole “human turning into kegare” discussion from earlier. Plus add in that he’s wearing the uniform of Rokuro’s school…and that’s not good. In the end though, this was a good episode. I can’t wait to see how this turns out and if it does become a total mess. Arguing and fighting there isn’t a good idea when another enemy can pop up while they are distracted. Hopefully Rokuro opens up….or else this doesn’t end well.